Into The Rice Bowl | Stoat – Where? 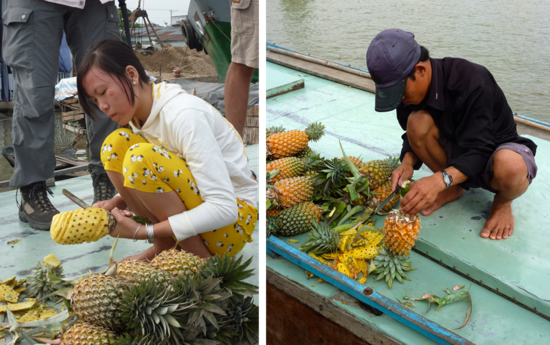 In which we venture into the Mekong Delta, find out lots about the rice industry, see rice factories and rice farmers, and try a local delicacy. With rice. The Mekong river enters Vietnam 200km due west of Ho Chi Minh City having already wound its way more than 4000km through Tibet, China, Myanmar, Laos and Cambodia. The vast delta formed by an explosion of tributaries covers about 40,000km2 and is home to around 21 million people. 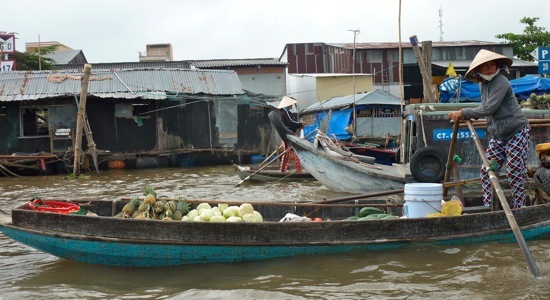 Our two day trip into the waterways took us through Cai Be, Can Tho and Cai Rang, offering just a glimpse into the way of life down here. The 12 provinces of the Mekong Delta collectively produce more rice than the rest Vietnam put together and for this reason the region is known as The Rice Bowl. They are a large part of the reason why Vietnam was the world’s largest rice exporter for the previous two years. In spite of this, or perhaps because of it, the average salary of people here is just $4 per day. Most of the big money is made by the factory owners, who take raw rice from the farmers for a pittance and sell the component parts. As we passed through on boats, we could see these factories where rice is cracked and processed. The Vietnamese truly do not waste anything. The raw grains that enter are converted into long grain white rice for food, wine and candy, broken rice for making rice noodles and rice paper, rice husks for which is burned to heat the mixture for the noodles and paper and rice husk powder which is mixed with other ingredients to make animal food. Even the spent rice husk ashes, formed after being used as fuel, are collected and sold back to farmers as fertiliser. It truly is a versatile grain. 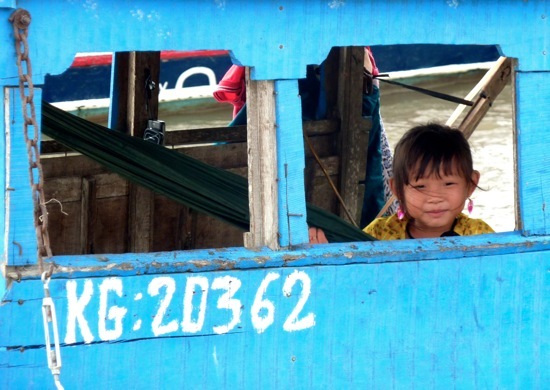 It is no exaggeration to say that the Mekong is the lifeblood of the people here. Not only used for transportation, 60% families in the delta rely on the river for washing, fishing, defecation, cleaning and trading – in essence, everything except drinking water. Many people here also use it for drinking water, making use of deceptively simple homemade filtration tanks. Dirty water (and it is dirty, as well as silted), is pumped into the houses, passing through pebbles, sand and coal to leech out the largest and most obvious sediment. This water is then dropped into a bucket and mixed with Aluminium Carbonate (AlCO3) and stirred, and clean water floats to the top as further sediment binds to the compound and sinks. The clean water is scooped from the top of the bucket and boiled, after which it is safe to drink. Time-consuming, but viable and reasonably safe, 17% of people in the Mekong Delta area rely on this method for extracting fresh water. Despite these precautions, there is unfortunately a higher than average number of stomach cancer cases in the region. The people here use every bit of space they can, planting crops inches from the edge of the water and houses on stilts over the water. The Mekong doesn’t have banks as such – there is just a point at which the river stops and the soil begins. During the rainy season, the river rises by a couple of metres and deposits rich silt over fields. Erosion of the river edge is handled in an elegant and ecologically friendly way. 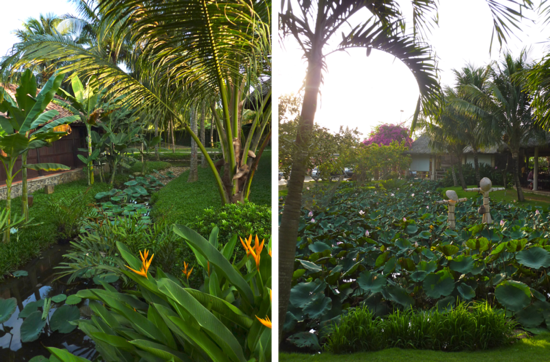 Rather than using concrete or plastic, water hyacinth, a naturally occurring weed, is gathered and used to insulate the land. While large quantities can be problematic, effectively managed it can be very beneficial. Abundantly available, farmers plant bamboo poles five feet from the edge and use it to cage the plant. As well as preventing the soil from being washed away, it also acts as a natural net to catch fish that are swept in at high tide and trapped at low tide, is used for fattening pigs and dried and used in basket weaving. The floating markets to be found here are also a spectacle. The largest, at Cai Rang, sprawls across the river. Though the Mekong is up to 3km wide in places, here it is a little over 600m and the mass of boats makes navigation tricky. We disembarked our craft and boarded a smaller rowing boat to get a better look and spent 20 minutes or so drifting between boats that doubled as store and house for their owner occupiers. Each one had a wooden pole attached to the prow, on which was hung the primary goods on offer, simply and effectively advertising what was available from a distance. With a standard minimum purchase of 20kg though, we weren’t there for buying, but we did manage to procure some of the sweetest pineapple ever tasted, skinned and chopped for us for 50 cents. On the savoury side, the local specialties of the Mekong are cobra and the euphemistically named field mouse. (It’s rat. It’s definitely rat). While not quite up to the challenge of tasting rodent, I did enjoy some satay snake. It has a unique texture, somewhere between chicken, pork and squid and tasted very good. 2 days naturally limits what it’s possible to see in such a large area. We did manage to get off the main arteries and into some small local tributaries where children and adults alike were excited to see us. Tomorrow we head to an entirely different part of Vietnam, Phu Quoc Island, apparently home to the world’s finest pepper and the world’s finest fish sauce, which promises miles long beaches with nobody in sight.